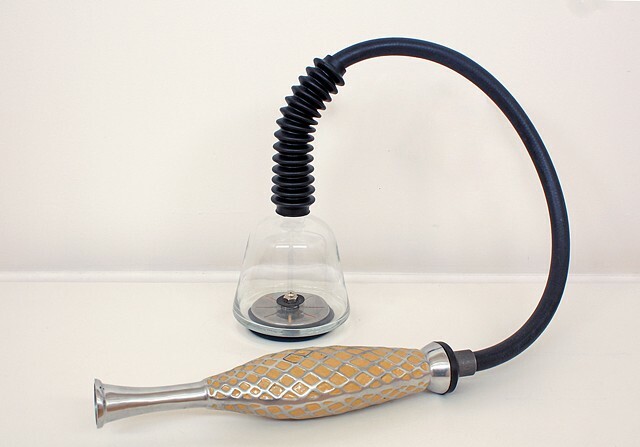 A sealed off, see-through container in the elegant, vacuum-like work, Succor, is connected by a hose to a decorative vessel with a fluted end. I saw something the Ghostbusters would use, if that story was set in a steampunk version of the Arabian Nights tales. Gazing at the work, I imagined the apparatus being used to trap some mythic smoke entity, which would remain on display in the glass cage. That may sound ridiculous, but it's mine, an intangible experience floating between the sculpture and my internal library of associations. Every onlooker will see something entirely different. So the artist is an alchemist, spinning the mundane into gold, But there is a constant shift going on between the work and its various viewers, who have an unconscious or realized power to transform what stands before them. Hoag's work stabs a pin in what a lot of representational art cannot—that no matter what you're looking at in this wide world, you're changing it based upon layers of experience and emotion, memory and desire."